Commonly used by researchers to develop technologies for modifying and studying genetic process, RNA interference (RNAi) has many potential uses in medicine, biotechnology, and functional genomics. 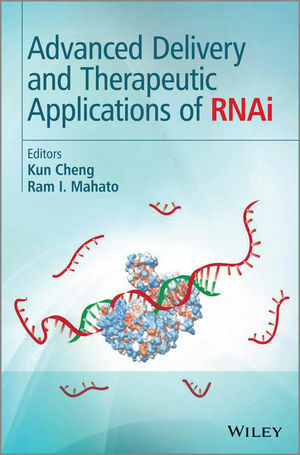 This book covers all essential aspects involved in the development of RNAi therapeutics, providing detailed guidance on the challenges and opportunities of bringing RNAi technologies from bench to clinic. It explores the design and mechanism of RNAi molecules, delivery strategies, and therapeutic applications in various diseases. Preclinical, regulatory, market, and intellectual aspects of RNAi technologies are also covered. Professor Cheng's research interests include the delivery and therapeutic applications of RNAi for breast cancer, prostate cancer, liver diseases, and type I diabetes. He has been working in the area of nucleic acids since 2002. He is co-editor of Advanced Drug Delivery with Dr. Ashim Mitra and Dr. Chi Lee (Wiley, 2012). He has also co-edited a themed issue entitled "siRNA Delivery" with Dr. Ram Mahato for the journal Molecular Pharmaceutics, and has developed and taught a graduate course entitled "Protein and Nucleic Acid Drug Delivery". Professor Mahato is a full professor of Pharmaceutics and Drug/Gene Delivery at the University of Tennessee Health Science Center Memphis. He is the author or co-author of 85 peer reviewed articles and book chapters. He has also edited/written five books and six special journal issues. He is a Special Features Editor of Pharmaceutical Research and on the editorial board of several journals. His research interest includes delivery and targeting of small molecules, oligonucleotides, siRNA and genes.